Sometimes pictures can speak a thousand words. Pictures of Chocolate Chocolate Chip Banana Nut Muffins…well, I’m thinking that might be over a thousand words. Just about all of them having to do with OH MY YUM! You’ve heard about people being crazy for muffin tops, right? Well, these muffins are definitely worthy of topping that muffin top list. I mean, on top of double chocolate banana muffins, a scattering of chocolate chips and walnuts! The toppings on the muffin tops have got to be calling your name. I used just a little bit of nonstick cooking spray when baking these delicious muffins, and had the best luck I have ever had with muffins not sticking AT ALL. I just barely loosened around the muffins, but really don’t think I even needed to do that. Chocolate Chocolate Chip Banana Nut Muffins–yes, the name is a mouthful–but you can be sure that its a mouthful worth biting into. I’m not much of a morning person, so baking up a batch of muffins on a school night is the perfect solution for me. It’s nice to be able to surprise my kids with a yummy breakfast treat without having to get up super early to bake. Not that these muffins really even take all that long from start to finish. But, some mornings every last minute I can sleep is appreciated. My kids dug into these muffins. As did their friends. And my friends. With several rave reviews, I know I’ve found myself a keeper. Moist, chocolate, and so, so tasty. And a little bit nutty (like me). Yep, I went for the win on this one folks. Mash bananas in mixer on low to medium speed until well mashed. Add in the remaining (except chocolate chips and walnuts) ingredients one at a time while mixing on low speed. Add in 1/2 of the chocolate chips. Spray muffin pan with cooking spray. I used two jumbo muffin pans, and the recipe made 12 jumbo muffins. Divide muffin batter between muffin cups. Sprinkle remaining chocolate chips and the chopped walnuts over the top of the unbaked muffins. Bake on 375 for 15-20 minutes or until a toothpick stuck in the center of a muffin comes out clean. Two yums ( thumbs) up for this yumminess. Oh these would be perfect for a weekend breakfast! Thanks so much for the recipe and for sharing on Show Me Saturday! Pinning! Jessica!! These look ‘sinfully’ amazing! Great share! Thank you for being a part of our party SHARE IT one more time, Saturdays. It wouldn’t be a party without you! Have a great week! Oh my gosh, these look wonderful! I’m not a morning person either, but who could sleep knowing that these were baked up and ready to eat? Thank you for sharing with See Ya in the Gumbo. I’m excited to tell you that these awesome muffins will be included in the final features tonight! Yum! 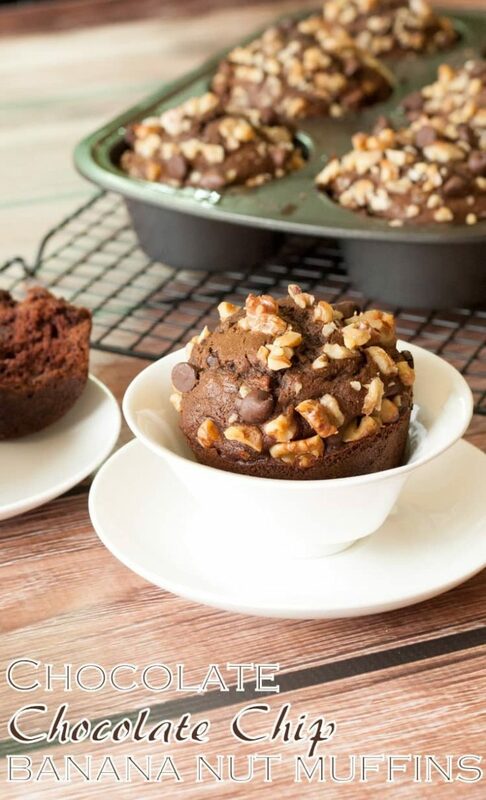 Bananas and chocolate are one of my favorite combos & these muffins look delicious. Thanks so much for sharing your recipe on Merry Monday. Oh my goodness, these look irresistible!! Stumbled and sharing. Thank you for bringing this deliciousness to the Hearth and Soul Hop! Wish I had one of your delicious Muffins to enjoy right now. Hope you are having a great day and thanks so much for sharing with Full Plate Thursday. Chocolate and banana are such a great flavor combo. I’d pay a lot of money for one of these to magically appear in front of me right this minute. Thanks for bringing this to Saucy Saturdays and hope to see you there again this week.